Kirkco is proud to provide state of the art, production quality, advanced two component meter mix equipment for flexible lamination applications. Manufacturing high technology laminated packaging films for perishable food products such as meats, fish and cheese. The films, which are normally constructed of either two or three layers, are bonded together with solvent free two component polyurethane adhesive. 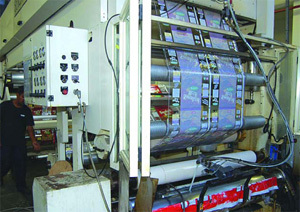 As part our continuous review of flexible packaging technology, including converting of high density, low density and linear low density polyethylene films, as well as producing cast polypropylene film, and the converting process to make a wide a range of sophisticated products â€“ from multi-layer and shrink films to decorated bags, various non-woven laminates, foil back products and High Shrink Sleeves and wrap around labels. With system for remote applications to serve multiple laminators, Kirkco can provide both solvent based and solvent-less single or multi-component laminating, as well as PSA and PUR Hot melt adhesive dispensers, heated multi-roll laminators and coaters. Providing clean workplace with all-round access to the laminators, a traditional location of metering, mixing and dispensing equipment close to laminating machine, or specialized bulk distribution supply unit improves operatorâ€™s movement around work area. The solution was to install a new Kirkco Flexible Laminating Meter Mix System to serve the new or existing laminators. The new system remotely located, with the metering units 15 meters away from the bulk supply of 200 liter resin drums, with all feed lines removed from foot traffic and replaced with rigid steel tubing located overhead, well out of harms way. In addition, the drums of raw material are tucked neatly away in a separate temperature controlled room and all the controls now wall mounted, leaving several meters of clear space all around the laminators.